Is Older Red Dinnerware Safe for Food Service? 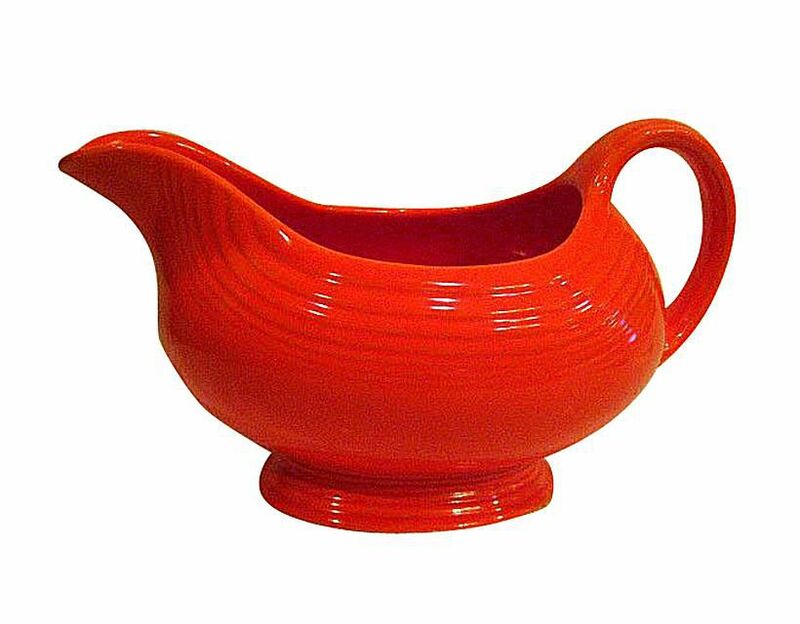 For quite some time, the rumor has been circulating that dinnerware made with red (which is more reddish-orange than true red) glaze is unsafe to use for food service. Fiesta by Homer Laughlin is the culprit named most often when this topic comes up. One urban collecting myth reports that red Fiesta has a high lead content making it unsafe for food consumption. Another rumor furthers the notion that red dishes test positive for radioactivity. Some people use the term "radioactive red" when describing these pottery glazes now, especially when trying to garner extra marketing attention. So what is a collector to believe when it comes to safely use dinnerware with red glazes? If you're going to be concerned about the safety, it's not only red dinnerware that should raise an eyebrow. In truth, the vast majority of older dishes were made using heavy metals of one sort or another. And in the case of red glazed dinnerware, uranium oxide gets a turn under the microscope as a possible concern rather than lead. Until bomb-making research took uranium away from dinnerware manufacturers during World War II, most all dinnerware glazes were made using uranium oxide. The red glazes contained more, which made them more expensive to purchase back in the day, but even light-colored dishes produced before 1943 contained some uranium oxide in the glaze. Then, after 1959, uranium oxide was once again used to produce the attractive, colorful glazes collectors admire. Some styles and patterns were made over many decades so pinpointing the exact date when dishes were made may take some effort. Looking at the manufacturer's marks and how they changed over time will often provide clues needed to make this type of dating assessment. And, there are times when dinnerware is unmarked, or the marks didn't change over time, so you're still left feeling uncertain about using a set for food service. Don't fret though. As it turns out, there isn't as much to worry about as the naysayers purport. According to information published on the Oak Ridge Associated Universities website, "it is likely that the major health issue associated with this dinnerware is not the radiation exposures but the ingestion of uranium or other metals that have leached into food or drink in contact with the dinnerware. One FDA study measured 1.66 x 10-5 uCi/ml in a 4% acetic acid solution in contact with the ceramic dinnerware for 50 hours — this exceeded the ICRP's maximum permissible concentration (MPC)." Are These Dishes Safe for Home Use? If you analyze the research, there is a possibility under the right conditions with continual use that a person using glazed ceramic dinnerware could ingest unacceptable amounts of uranium. But how often do you eat acidic foods that have been in contact with a plate for 50 hours? Most collectors groups dealing with vintage dinnerware do not buy into the notion that these dishes, red or any other color, are unsafe. If you are personally concerned, then finding an alternate method for food storage would likely be the answer given the research at hand. Would Antique Experts Eat off Older Dinnerware Containing Uranium Oxide? More than likely, yes, and they would enjoy every bite. But each person has to proceed within his or her comfort zone. If you do not feel safe serving food on older glazed dinnerware based on your knowledge and research, perhaps you can enjoy displaying it in your china cabinet as an alternative. Or, you could consider passing it along to someone else who feels more at ease using and enjoying these collectibles for their intended purpose.